Alban Denton, Managing Director of Loch Duart Ltd, giving a candid talk at the St Andrews Business Club AGM. Alban Denton, Managing Director of Loch Duart Ltd, was the speaker at the Club’s AGM evening on April 5 2017 – the best attended in many years. Loch Duart Ltd is one of the world’s leading producers of premium whole fresh Scottish salmon. Alban is also Non-Executive Director of Suttons Group, the international transport and logistics group. A graduate in Agricultural and Food Marketing and an MBA, he has delivered profit growth and restructuring as well as organisational and cultural change in a variety of food manufacturing and agricultural businesses over more than 26 years – from Kettle Produce and Grampian Country Food Group to Warburtons and Loch Duart Ltd.
Alban also has retail experience in both store operations and buying with Marks and Spencer having started his career managing the brand’s flagship Food Hall at the Marble Arch store. He explained the importance of sustainability in fish production before going through Loch Duart Ltd’s background and its transformation from 30 staff producing 1,800 tonnes of fish in 1999 to 115 staff who’ve delivered its transformation to 5,000 tonnes in 2016. 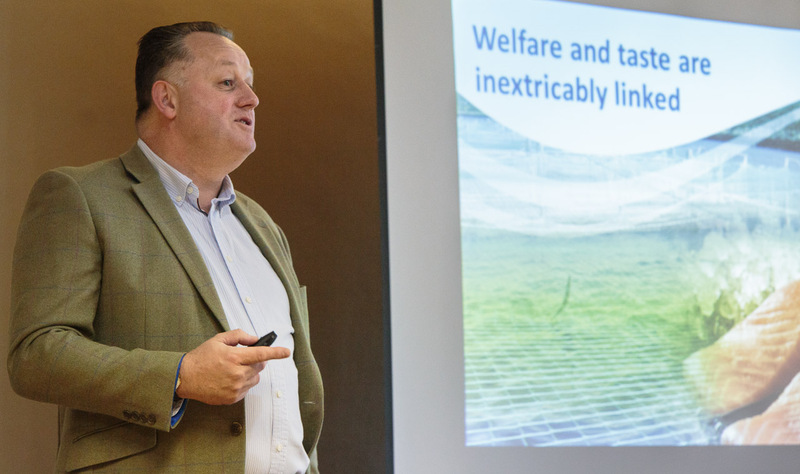 He then talked the rapt audience through Loch Duart’s USPs – including low stocking density, rotation scheme, natural cleaning, feeding priorities and top Omega 3 concentration – before explaining how they tackle sea lice and the key link between welfare and taste. The result is a list of rave product reviews from top chefs (Gordon Ramsay, Raymond Blanc and Rick Stein) and food critics as well as being sourced for Royal events. One of Alban’s key themes was how the success has been built through getting the local community energised by the company’s mission and helping it share in its success, collectively and individually – one staff member received rapid promotion after he identified her ability to play a key role at a higher level. He also shared a very candid appraisal of what makes Loch Duart different, how he helped steer it through an existential crisis as well as its progress in the last 12 months and priorities going forward. Finally, Alban answered questions on a variety of topics, including how it gets its salmon to chefs around the world ready for them to cook 48 hours earlier than its competitors.